Cisma Sports Management Pvt. Ltd. Please wait till you see the message ‘Registration Successful’ after making payment. No Queues! No Waiting! Choose Your Own Time! * In the Open Division any amateur person of any age group other than elite class viz.parents, spectators, supporters, coaches, officials etc. can participate. Notice 1. Entry fee: On or before 28 February 2019 - Rs. 1000 2. Entry fee: From 1 March 2019 to 5 March 2019 - Rs. 2000 3. Entries will not be accepted after 5 March 2019 4. Event venue: Chhatrapati Shivaji Sports Complex, Balewadi, Mhalunge, Pune 5. Event date: 09 March 2019 6. Event starts at 08:45 AM. Please report 30 min before the event time alloted to you. Notice 1. Entry fee: On or before 28 February 2019 - Rs. 800 2. Entry fee: From 1 March 2019 to 5 March 2019 - Rs. 1200 3. Entries will not be accepted after 5 March 2019 4. Event venue: Chhatrapati Shivaji Sports Complex, Balewadi, Mhalunge, Pune 5. Event date: 10 March 2019 6. Event starts at 07:00 AM. Please report 30 min before the event time alloted to you. 1. Entry fee: On or before 28 February 2019 - Rs. 1400 2. Entry fee: From 1 March 2019 to 5 March 2019 - Rs. 2800 3. Entries will not be accepted after 5 March 2019 4. Event venue: Chhatrapati Shivaji Sports Complex, Balewadi, Mhalunge, Pune 5. Event date: Triathle - 09 March 2019 & Biathle - 10 March 2019 6. Triathle Event starts at 08:45 AM. Biathle Event starts at 07:00 AM. Please report 30 min before the event time alloted to you. 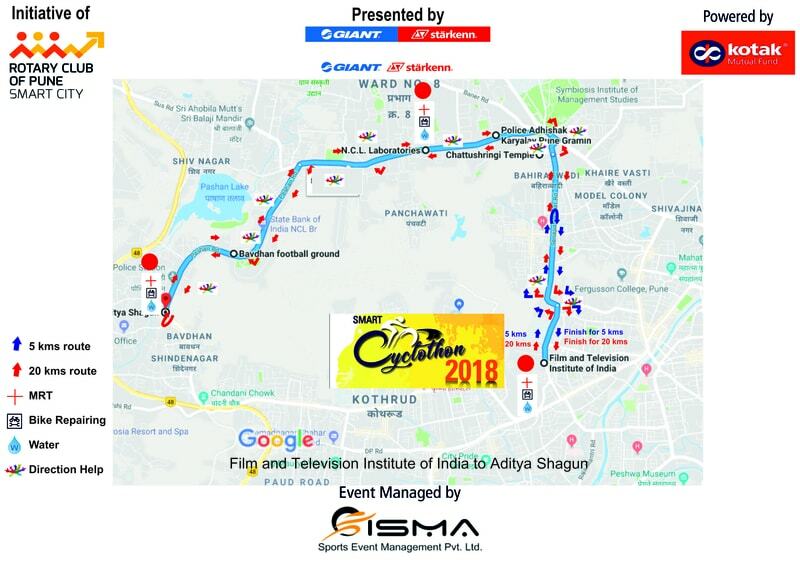 About The Event: SMART CYCLOTHON 2018 for a Smarter and Greener Pune is an initiative of Rotary Club of Pune Smart City, event is managed by CISMA Sports Event Management Pvt. Ltd, supported by Giant Starkenn and is powered by Kotak Mutual Fund. This will be a cycling rally of 5 Kms and 20 Kms and will be flagged off from Film and Television Institute on February 11th 2018. We solicit your support by participating in this event along with your friends and colleagues. It will help us making this event successful and go long way in Pune attaining its past glory! Cycling enthusiasts, Cycling groups and first time Cyclothonians are all welcome and we look forward to your participation. You will have to present your photo id and age proof at the time of the event. This event is only for Maharashtra State Resident Swimmers. Program Of The Competition Races will be combined in the interest of time, but medals will be awarded according to swimmers' respective age groups. In an event of less than three swimmers after combination, race will be considered as a walk over. Notice 1. Entries will be accepted online on www.cismasports.com from 29 December 2018 to 16 January 2019. 2. There will be Heats and Finals. First six best timings from the heats will be taken into account as per age group for the Super Sprint for 50 Mtrs. event. 3. Competitor making use of Swimming Pool will do at their own risk. 4. Chief Refree's decision will be final. 5. Protest Fees Rs. 500 6. For mixed relay, 2 Boys and 2 Girls of same club and as per age group are permitted. Age group 1) 10 Years & below 2)11, 12, 13, 14 Years 3) Open 7. Entry fee Rs. 100 per event and Rs. 300 per relay. 8. Relay entries will be taken on the spot. 9. Last date of registration 16 January 2019. (Recognised by Swimming Federation of India) Tournament Secretary Mrs. Neeta Talawlikar. Contact Number: 9850646142 Tournament President Mr. Vinay Marathe. Contact Number: 9689893714 Notice 1. Event dates: 02 March 2019 & 03 March 2019. 2. Entries will only be accepted online on www.cismasports.com 3. Event Venue: Balgandharva Rangmandir Campus, J.M. Road, Shivaji Nagar, Pune. Event starting from 06:30 AM sharp 4. Entry fee Rs. 500 5. Last date of registration 25 February 2019. 1) Please do not press back button of your browser when you proceed to the event form. 2) If you upload incorrect documents you would be barred from the event. 3) Please report 15 minutes before of your alloted time. 4) Please wait till you see the message 'Payment Successful' after making the payment.